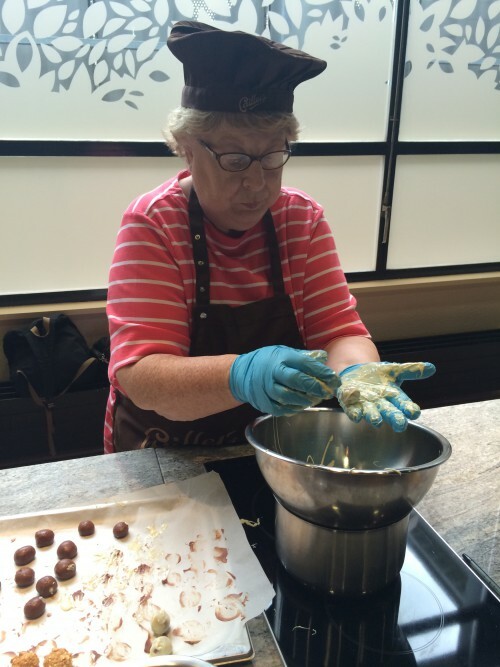 As I mentioned last time, Mom had said that one thing she wanted to do was to go to a chocolate factory. Well, she had come to the right country! Switzerland does have the very best chocolate in the entire world. 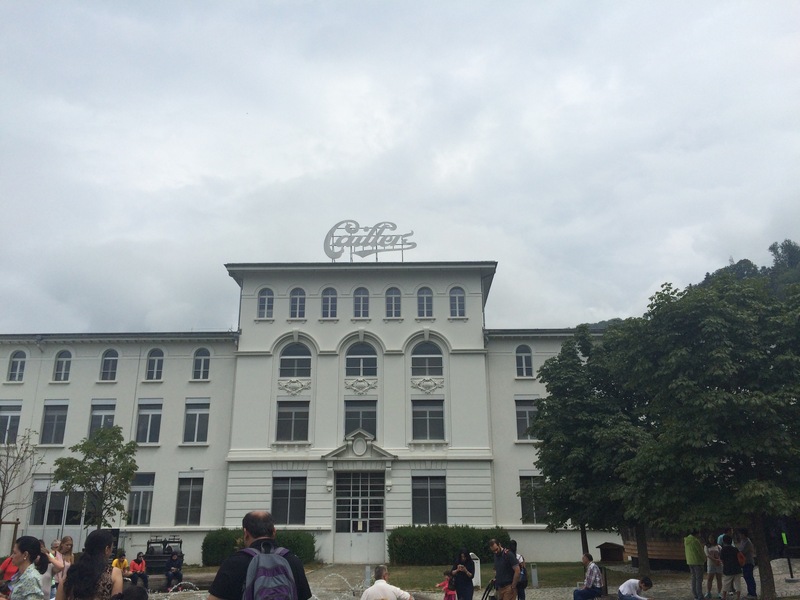 I am partial to Laderach chocolate and buy it for my whole family all the time, but the go-to place for chocolate factory tours is the Callier factory in Broc, Switzerland. 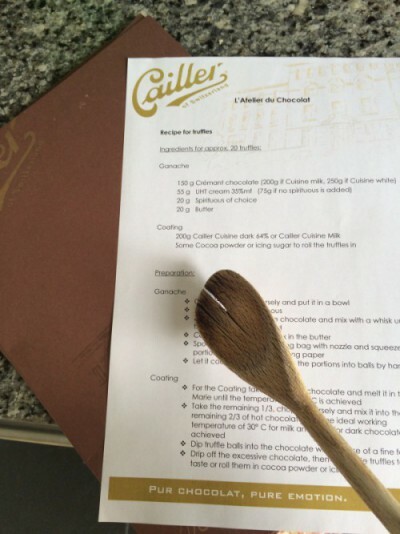 Callier is technically owned by Nestlé, however, they were once partners. In 1857, Daniel Peter Callier, the son of founder François-Louis Callier, had the idea of combining his chocolate with Henri Nestlé’s condensed and powdered milk to make milk chocolate. In 1879, Nestlé and Callier combined their efforts to form the Nestlé Company. Eventually, in 1929, Nestlé ended up buying Callier and consolidating their chocolate holdings. 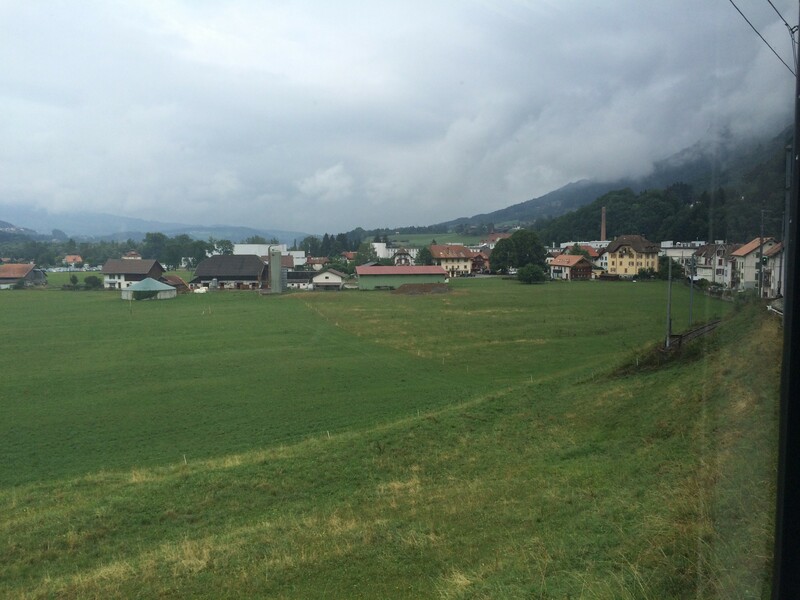 As I said above, the factory is in the very small town of Broc, Switzerland. Broc is a tiny village and has a population of only 2500 people. It seems like a large portion of the population works at the factory. There are not only the factory workers, but there is the tourist end of the factory as well. 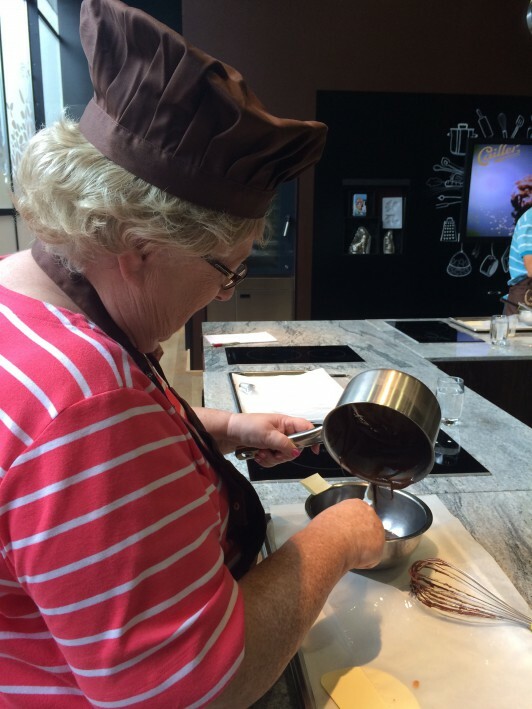 PLUS you can take chocolate making classes in a large cooking classroom right in the center of the tour waiting area. The building cuts a majestic figure against the sky. 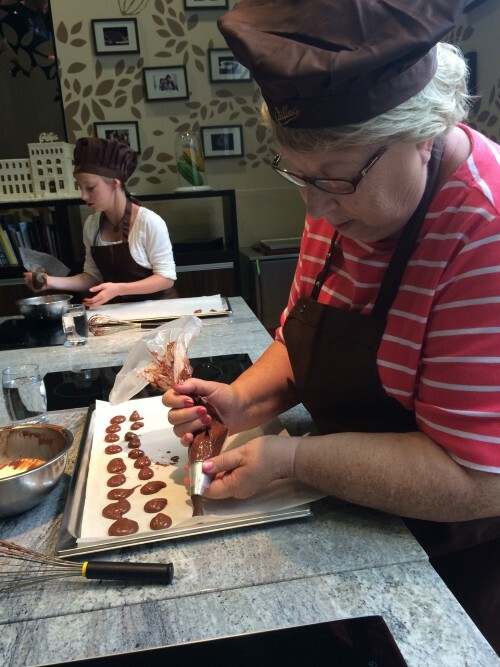 For Mom’s birthday I arranged for us to take a chocolate truffle making class at the factory. There is really nothing better, in my opinion, than having a chocolate truffle. Now, one could argue that giving me the knowledge to make my own chocolate truffles is incredibly dangerous, but I do solemnly vow to use this knowledge only for good. The men went off and had a tour through the factory itself. They learned all about the history and making of chocolate. The boys got to try an actual cocoa bean and then to make up for being tricked into eating the bitter and yucky cocoa bean they got the equivalent of a bar and a half of actual and delicious chocolate in samples given at about 12 different locations through the plant. That was pretty much all I got out of the boys, although E did say that every child in the world should take this tour so that is something. Mom and I went down into a large teaching kitchen and were greeted by Mary from Birmingham, Alabama, the sous chef and wife of head chef Thomas. She directed us to two stations that were complete with a chef’s apron. We were really happy. And then we looked under the apron and found a chef’s hat. A chef’s hat!! I have always wanted a chef’s hat! And they were in a fetching chocolate brown color. Then they set us loose to create our own truffles. The room filled with the sounds of packages of chocolate being smacked against the counter surfaces. We were making the ganache or better known as the creamy tasty center of the truffle. I think Mom did a great job of mixing up her chocolate centers. Mine was a little loose because I added too much liquor. I guess I should have saved more for myself. We let our filling cool and Thomas showed us how to pipe out the filling so we could make it into balls. Thomas took his time and showed us how to correctly pipe a couple and answered questions. Then he piped out the rest in about 30 seconds and each were exactly the same size and shape. That was a bar none of us would hit, though some would try. So Mom and I went to work. My ganache was too runny and had to be put in the blast chiller to set up. I felt like I was every contestant who made it to the dessert round on Chopped! “All I could do was just put it in the blast chiller and pray.” Mom’s, however, was perfect. We finally got them all piped out and we only had chocolate on 8 of our 10 fingers. Mine went back in the blast chiller and Mom’s got to go back in the fridge with all the other well-behaved ganache. And we were finally at the coating stage! That is the step right before the eating step. Yay! Thomas, knowing his audience, gave us all blue latex gloves because this was going to be incredibly messy. Instead of dipping the ganache centers into the chocolate you smear your hand with the tempered chocolate and then roll the centers in your hand to coat them. Apparently you use less chocolate that way. You also need a partner – an Ethel to your Lucy, as it were – because while Lucy is gunking up her hands with warm liquid chocolate Ethel needs to be taking these almost-truffles and coating them in some other kinds of tasty goodness. They had silver cocoa nibs, gold and sparkly Rice Krispie-like cereal, powdered sugar, and cocoa powder to choose from. We chose cocoa nibs and Rice Krispies. Powdered sugar and cocoa powder seemed to messy, but in retrospect we really couldn’t have gotten any messier. We had about 36 truffles each to coat and we were going as fast as we could. We were basically racing against time to get all these truffles coated and done before the chocolate hardened. One of us was rolling it with chocolate and then tossing it into the coatings bowl. The other one was tossing it through the nibs or Krispies – one in each hand – as quickly as we could to get them back onto the tray and into the fridge. Believe me, there was a large temptation to just shove them into our mouths and skip a step or two. However, we exhibited incredible self control and all the truffles made it from the coatings bowls back onto the tray. Then Mary and Thomas handed out awesome chocolate gift boxes and fancy bags for our finished truffles. We packaged them up, again fighting off the temptation to just eat them instead. We not only got to take the truffles home with us, we also got the keep the aprons and hats, AND we got diplomas! Yes, indeed! 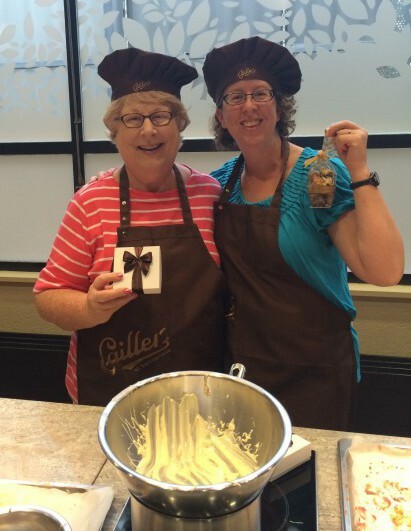 Mom and I are actual graduates of the Callier Truffle Institute and we can make truffles in our own home. If you don’t have this diploma and you are making truffles at home you just might be breaking the law. Maybe. I think. I might have to check on that, but consider yourself warned. And I got the recipe. I think I will make some next weekend. This weekend we will be in Pisa, Italy for an economic conference. Well, Mark will be at the conference. The kids and I will be wandering around Pisa and probably Florence. Yay! But it was such a fun time for Mom and I. We both love to cook and this was something neither of us had ever done before. 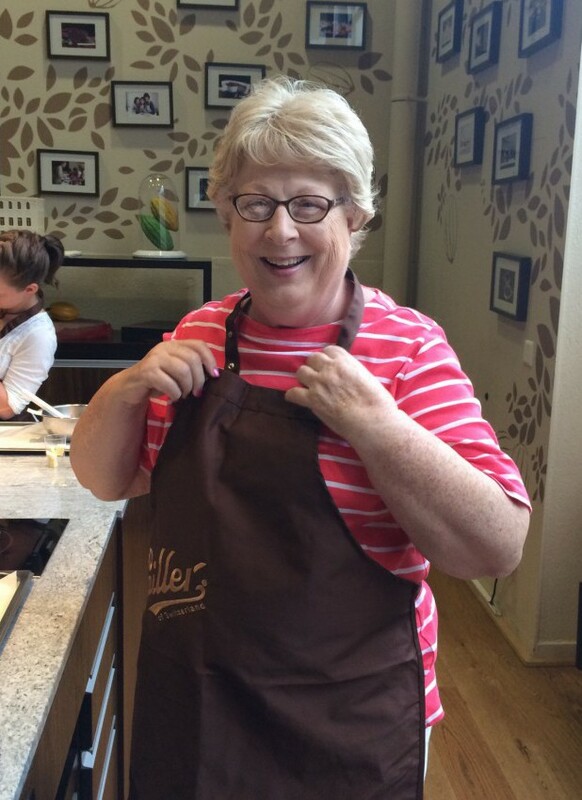 Now when I make my own truffles I will remember how much fun we had and how fearless Mom was in the face of melted chocolate and flying cocoa nibs. Mountain Adventures with the Ruzicka Grandparents!